Dehetre relies on the finger-prick test and manual insulin shots, a method that costs about $250 per month. It is a cost that's increasingly being absorbed by consumers, through higher premiums, co-pays and deductibles. Next week, Maine lawmakers will consider several state-level proposals to rein in costs and provide relief to those worried about affording the drugs they need. At least four times a day, 48-year-old Michelle Dehetre of Lewiston needs to test her blood sugar. She has Type-1 diabetes. It's a serious, chronic disease, that requires constant monitoring. "I just prick my finger with the lancet, and I'm putting it on the test strip," Dehetre says. Her reading is high: 386. "So it’s like three times where my blood sugar should be." 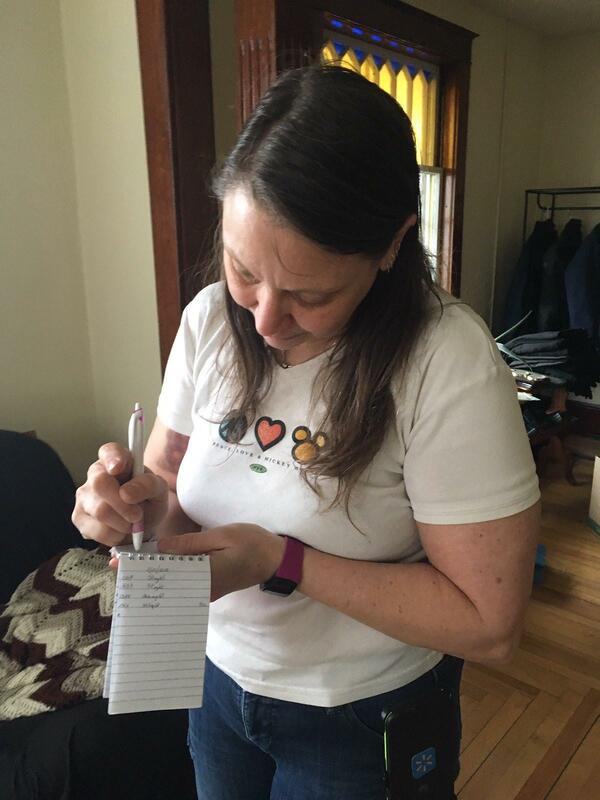 Dehetre keeps track of her blood sugar levels on a notepad. Dehetre needs to give herself a shot of insulin to bring her blood sugar — or glucose — down to normal. She used to have a glucose monitor and insulin pump that automatically tested her levels every few minutes. But then her insurance changed, and she had to cover more of the cost. The tab for three months worth of supplies was $1500. "That is basically almost one month's pay for me," she says. Dehetre relies on the finger-prick test and manual insulin shots, a method that costs about $250 per month. She says it is still a struggle to afford. And, without constant monitoring, her blood sugar fluctuates more widely between highs and lows — sometimes, dangerously so. She says her family has to call for an ambulance regularly. This winter while driving with two of her sons, she says, her blood sugar dipped so low she nearly passed out and was taken by ambulance to the Emergency Room. "It’s really scary, because when your sugar is back up enough where you’re aware of what's going on and what happened, it comes to you that, ‘oh my god, I could have killed myself. I could have killed my boys.’ And it’s something that could easily be remedied by proper medications, or the proper treatment, I should say," she says. 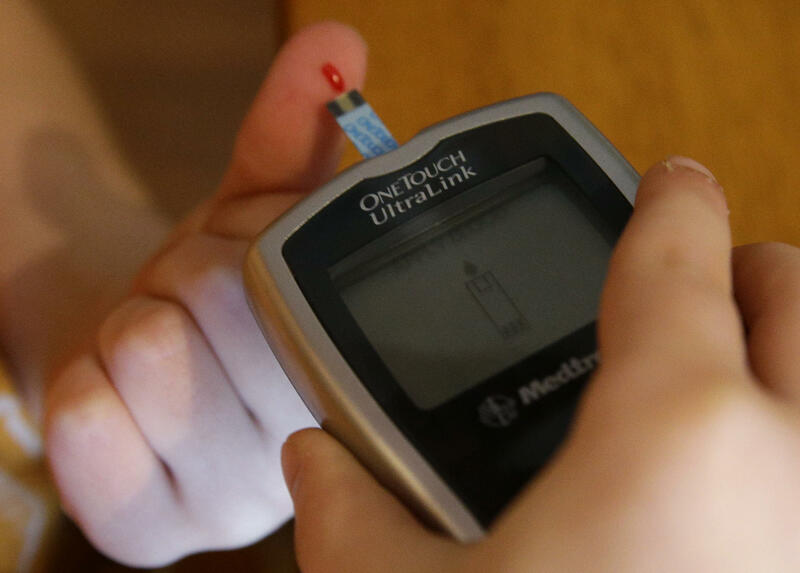 Her endocrinologist, Dr. Irwin Brodsky of Maine Medical Center, says Dehetre has a complication from diabetes that makes her unable to tell when her blood sugar is low. That is why she needs a continuous monitor and pump. But because it's unaffordable, he has to try to find alternatives for her. "The alternatives are, you know, sort of MacGyver-type alternatives," says Brodsky. 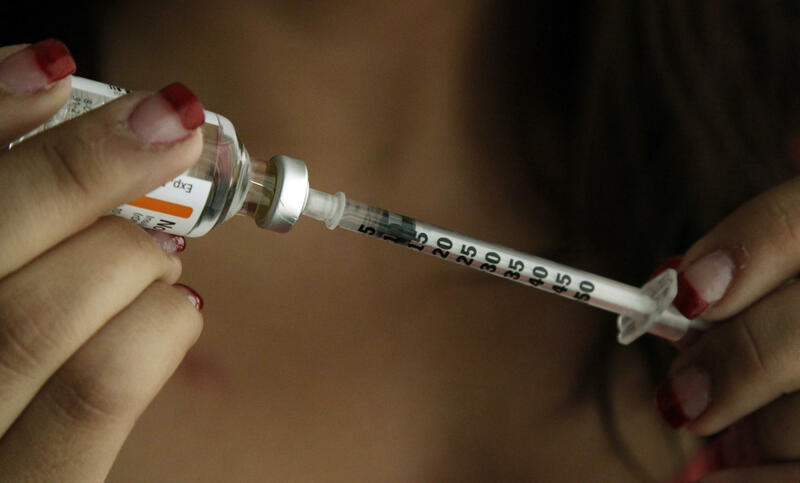 In Dehetre's case, older versions of insulin are not as effective, and Brodsky says he cannot understand why the insulin Dehertre relies on is so expensive. "These are the same items that were available in the 1990s, so that was 20-some years ago,” he says. “They haven't changed since then." It is not just insulin that is expensive, says Lori Parham of AARP Maine. In 2017, she says, the average price of brand name drugs increased at four times the rate of inflation. Dehetre needs to give herself a shot of insulin to bring her blood sugar down to normal. "We've seen prescription drug prices increasing over time,” Parham says. “But what we find now is we’re really getting to a tipping point." "As prescription drug prices increase, people are being required to pay more, not only in premium dollars, but out of pocket," says Ann Woloson, the executive director of the advocacy group Consumers for Affordable Health Care. A recent poll commissioned by the group found that two-thirds of Mainers are worried about affording medications they need. "It’s a situation that policy makers really need to address as soon as possible," says Woloson. Maine lawmakers are considering several proposals in the legislature. Two bills would allow the importation of drugs from Canada. Another would require more transparency from pharmaceutical companies about their costs. And one bill would establish a state board that would have the authority to set and cap drug prices. "At first blush, these proposals appear to fail to address what actually drives the cost of medicines and what patients pay at the pharmacy counter, including the middlemen in the supply chain," says Tiffany Haverly, a spokesperson for PhRMA, a drug company trade group. Pharmaceutical companies frequently point to others in the drug supply chain as the source of high costs. Specifically, the middlemen who negotiate drug rebates for insurers. They have recently come under fire for pocketing the bulk of those savings. Another Maine bill targets those middlemen, which Haverly expressed more support for. "We are open to working with legislators if there is something that would bring transparency to the supply chain," Haverly says. But as pharmaceutical companies try to shift focus away from their role in drug prices, their profits are increasing. A report from the U.S. Government Accountability Office found that annual profit margins among the largest drug companies have increased by as much as 20 percent in recent years — more than double the profit margin that non-drug companies saw. Benvie and her wife decided to use a credit card to pay for her prescriptions, and it has dipped them into medical debt. And while some consumers go without medications they can't afford, others turn to different options. Jodi Benvie of Windham says she was hit with high drug costs two years ago after her insurance policy changed. "I drive up to the window of Walgreens and the pharmacist says, 'Are you aware of the cost of this medication?' And I thought, that was very dramatic,” recalls Benvie. “Maybe I’m not aware of the full cost of this medication. And I said, 'Maybe I’m not?' And she said, 'It’s $1125.' And I had this instant panic." Benvie has bipolar disorder. That medication, she says, makes it possible for her to function and go to work. She says she drove off without it, wondering where she would come up with a thousand dollars. Ultimately, she and her wife decided to use a credit card to pay for her prescriptions, and it has dipped them into medical debt. "So the 2018 bills might be paid off by the end 2019, and then we just have this kind of continuous cycle," she says. Benvie says she is not sure what a fair price for her prescription would be. She just knows the medication she relies on costs too much. Originally published 3:50 p.m. April 12, 2019.